Figure: KIM-1 ELISA Kit from Enzo Life Sciences, Inc. Strengthening its position as an innovator in tools for detection of acute kidney injury (AKI), diabetes, and toxicity, Enzo now offers the most sensitive KIM-1 (human) ELISA Kit. KIM-1, also known as kidney injury marker 1 or TIM-1, is the most highly upregulated protein in the proximal tubule of the injured kidney and is detectable in the urine within 6 hours of injury. KIM-1 has been identified as an early diagnostic and prognostic marker of AKI resulting from illness, trauma, or nephrotoxicity, and with decreased kidney function and renal failure associated with chronic disorders such as diabetes and high blood pressure. This quantitative ELISA kit offers ultra-sensitive detection enabling quantification of both normal and disease state levels of KIM-1, detecting as little as 1.2 pg/mL of KIM-1 in human urine. The assay provides quantitative results with excellent reproducibility between experiments, and offers efficiency over Western blotting by requiring less sample input, and analysis of up to 38 duplicate samples in less than 2 hours. The ELISA displays high specificity to human KIM-1 with low cross reactivity to similar molecules such as TIM-3 and TIM-4. Like all Enzo Life Sciences ELISA kits, the KIM-1 ELISA kit is complete, flexible, and put through rigorous fit-for-purpose validation and stability testing to ensure high precision, accuracy, sensitivity, and specificity. It is supplied with an easy-to-follow protocol, pre-coated microtiter plate and liquid color-coded reagents to save the user time and reduce errors. The 96-well break-apart strip plate design provides throughput flexibility to minimize waste. The KIM-1 (human) ELISA kit is the most recent addition to Enzo’s industry-leading portfolio of products for kidney injury and diabetes research, including ELISA kits for detection of NGAL, Cystatin C, and Creatinine. 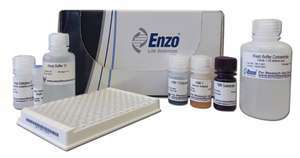 For more information or to order the KIM-1 (human) ELISA kit or other Enzo Life Sciences products, please visit us at www.enzolifesciences.com or call us at 1-800-942-0430.